We had a fantastic day in Brooklyn today with the support of Open Source Gallery, Arts & Democracy, the Brooklyn Ladies Club, and the Bangladesh Institute of Performing Arts. First, I visited Open Source Gallery in South Slope, Brooklyn, NY for my second site visit in preparation for my upcoming exhibition/project “Seven Minutes on the B67,” which explores community and climate change through conversation (adda), food, and collaborative art on saris. 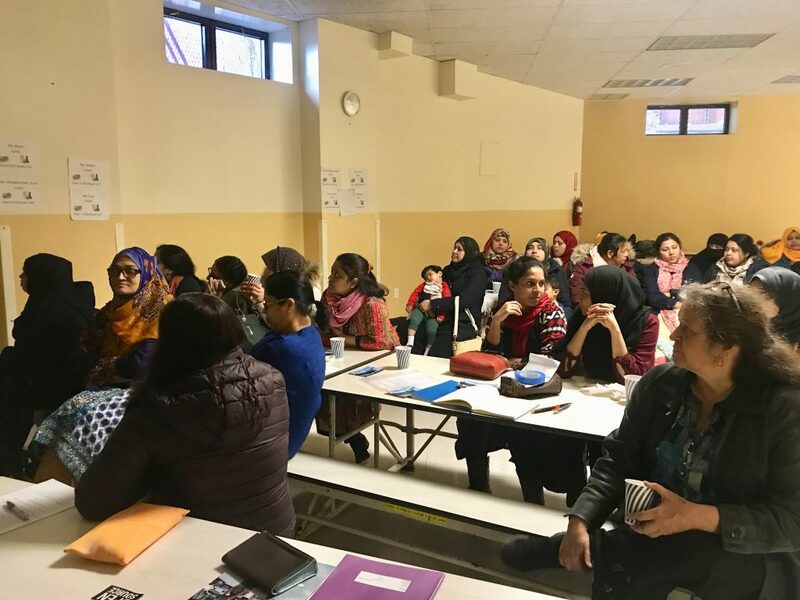 Through this project, we will connect women of the Bangladeshi diaspora in Kensington with the community in South Slope, which are only seven minutes apart by bus. 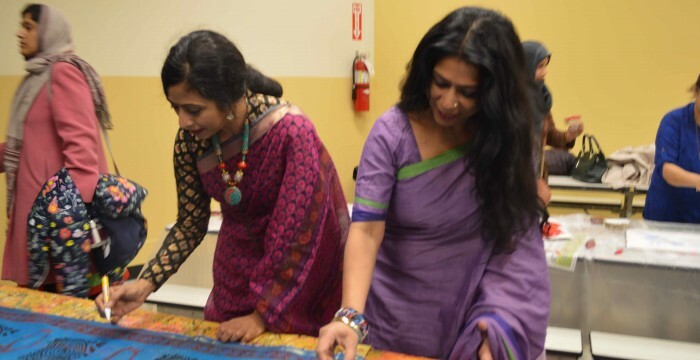 We will have discussions about climate change and food insecurity in Bangladesh, New York, and around the world while we eat Bengali snacks and make art together. After our meeting in the gallery, Monika Wuhrer (director of Open Source) drove me over (5 minutes by car) to PS230 in Kensington along with my two suitcases full of materials and a projector and speaker from the gallery. 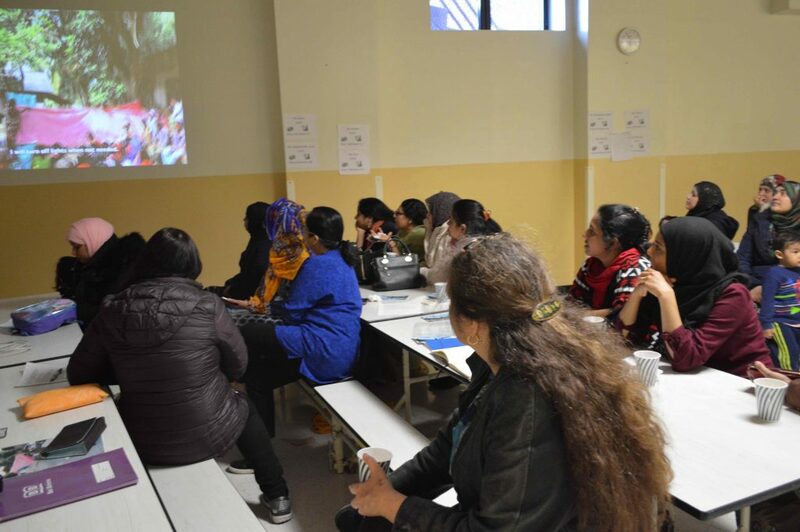 At the PS230 lower school cafeteria we met up with the wonderful organizers at Arts & Democracy (Carol Atlas and team) and the women and children of the Bangla diaspora from the Kensington neighborhood, BIPA, and the Brooklyn Ladies Club. 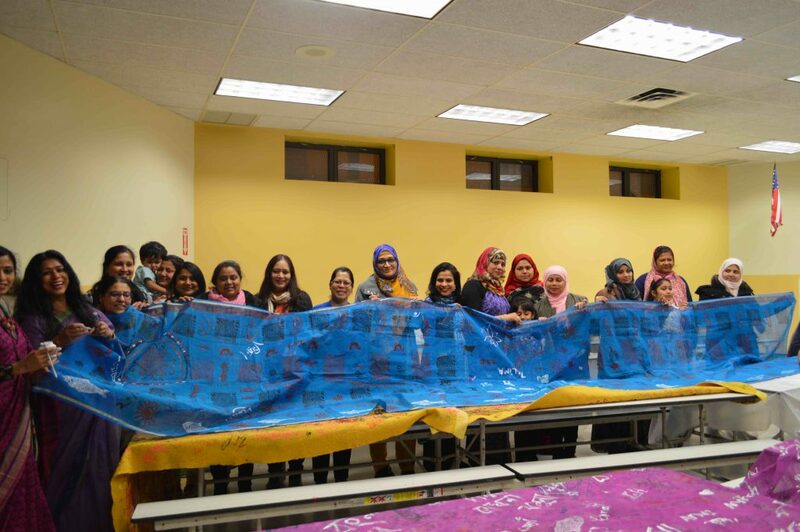 What a huge turnout we had — there were over 40 women and children who joined the Storytelling with Saris workshop! 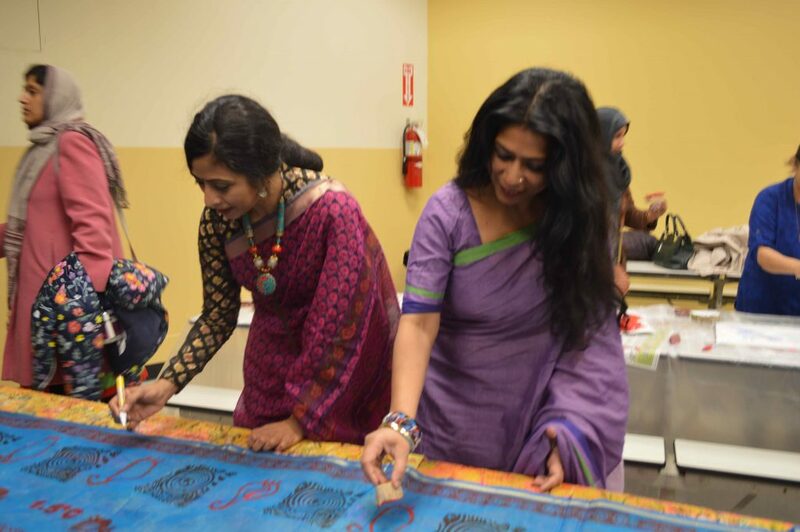 We watched some images and film from Bangladesh and around the world of the Storytelling with Saris project, and then got to work on two saris. 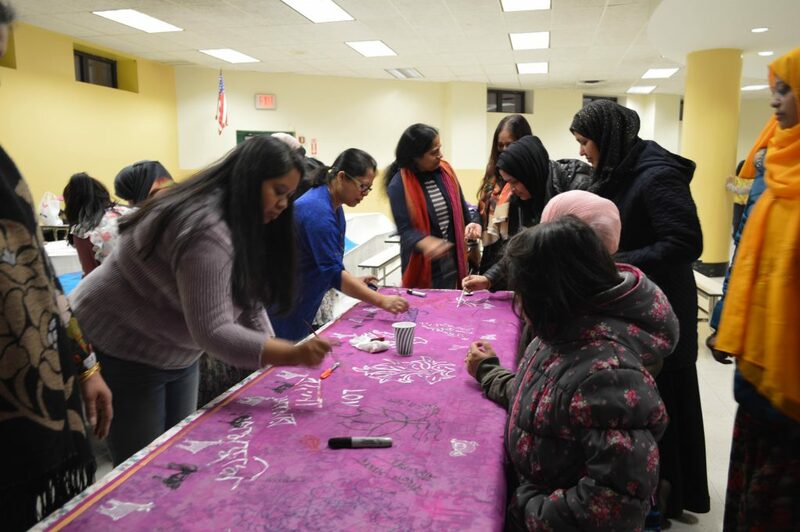 The blue sari is the Solidarity or Ekota sari, which was partially made by our sisters in Katakhali Village during my recent visit there and then completed tonight by the Bangladeshi ladies of Brooklyn. The color of the second sari was chosen by majority vote (pinkish purple won out over deep green) and was covered with beautiful hand painting, hand drawing, and a Goru-Chagol border of cows and goats from my new woodblocks about food insecurity. The women of Katakhali have told me that after each storm, their cows and goats and chickens and ducks die. Arts & Democracy provided delicious piping hot and spicy chicken samosas, along with an assortment of juices, and cookies for the kids. The children were doing an art competition with BIPA at the other side of the school cafeteria, and many of them joined the sari workshop afterwords and discussed climate change with me. The children wrote and drew about how they will watch less TV and play outdoors more to help cool down the planet. Incidentally, there are a large number of Bangladeshi children enrolled in PS230, and the announcements on the bulletin board for parents are in Bangla as well. We will meet again on May 3, 2019 when I’m back in NY for my artist’s talk at Open Source Gallery. Then we will have a collective iftar for the exhibition opening on May 22, 2019 at Open Source. Some of the Kensington women will make food for the iftar. There will be a closing reception with performance and storytelling on June 29, 2019 at Open Source. Thank you to everyone who joined last night and to all the people that made it possible and got the word out. It was a wonderful experience for me to connect with all of you. I was also delighted to have my family from Bangladesh (who have just recently arrived in NY as immigrants) come and join the workshop and help me with clean up. And it was lovely to have filmmaker Nandita Ahmed (who documented the first Storytelling with Saris trip to Katakhali Village and is part of the creative team on a longer film) also join as at the end of the evening for Bengali dinner in the neighborhood. Looking forward to more adda, food, and art with the amazing people of Brooklyn. Special thanks to Open Source, Arts & Democracy, and BIPA for inviting me and supporting this project. All images ©2019, Monica Jahan Bose.